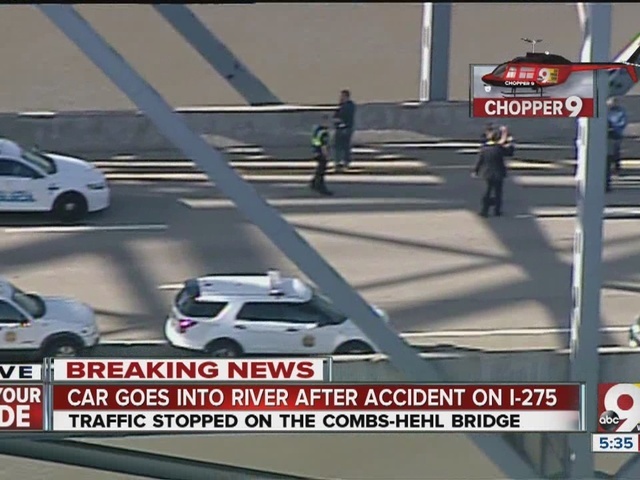 NEWPORT, Ky. - Rescuers were still developing a plan to raise a car from the Ohio River after it fell off the Combs-Hehl Bridge on I-275 during a "horrifying" series of crashes, police said late Tuesday night. "It's challenging," Capt. Dave Appel said of the task facing the Boone County Water Rescue Team. The team would "first identify if there are victims in the vehicle and then they will make an assessment as to whether it’s best to try to extract any persons that are found or whether it’s best to try to float the vehicle," Campbell County Police Chief Craig Sorrell said at a late news briefing. Authorities weren't ready to discuss who had been in the car. The car went off the bridge near Coney Island during a series of chain-reaction crashes about 4:30 p.m., according to police. It happened when a semi rear-ended several vehicles that were stopped in the eastbound lanes after a fender-bender at the Kellogg Avenue exit, a witness told Cincinnati-based WCPO. "It was horrifying," the witness, Becky Stratton, said. Twelve vehicles were involved in four separate collisions, according to Sorrell. Injuries to the motorists on the bridge were not life-threatening, he said. "The cars were driving to navigate through and slow down, reduce speeds at various contact points, and at some point in that, one vehicle did go over the side of the bridge into the river," Sorrell said. Rescue boats searched desperately for hours before locating the car with imaging, officials said. 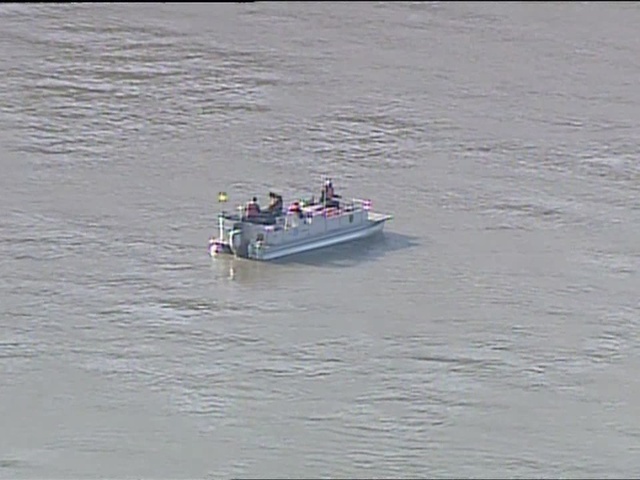 Three boats circled under the bridge and later expanded the search downriver. "The vehicle is pretty close to the bridge, which is somewhat surprising given the high water and the rapid current that is going on from the rain," Sorrell said. The eastbound lanes of the bridge were closed for almost six hours, which caused a major traffic backup on I-275 toward Ohio. Eastbound traffic was stopped at I-471 and backed up for miles. For hours, eastbound drivers who had been stuck between I-471 and the bridge had to cross the median and turn around - one vehicle at a time. "It’s been a mess," said trucker Walter Skipper. "I have been here an hour and 33 minutes." The eastbound lanes reopened about 10 p.m.
Stratton said she was terrified as she saw the semi plow into traffic. "I was just praying to God he didn't go over the side of the bridge or another car didn't go over the side of the bridge," she said. She told WCPO she was stopped on the bridge in the center lane and saw the semi coming in her rear-view mirror. "Some type of a work van and a passenger car had collided right there at the exit, and they had stopped all the traffic and everybody was slamming their brakes on – me included. I almost hit someone. Luckily I did not," she said. "And then I just happened to hear all that carnage behind me, and I just saw [the semi] in my rear-view mirror coming closer and closer, and I was praying that I wasn't in his path. He swerved over to the right and hit the right side of the bridge and I saw cars spinning and I saw a car – I don't want to say go up in the air, it was up underneath him - and I just saw metal, and I smelled rubber." The crash reconstruction team was still on the scene late Tuesday night. Sorrell said it might take one to two weeks to sort out what happened. "They will be trying to piece this together and it will take some time over the next week or two weeks to get all the pieces put together," Sorrell said.